On first publication, this uncommonly concise and readable account of Soviet Russia's clash with Nazi Germany utterly changed our understanding of World War II on Germanys Eastern Front, immediately earning its place among top-shelf histories of the world war. Revised and updated to reflect recent Russian and Western scholarship on the subject, much of it the authors' own work, this new edition maintains the 1995 original's distinction as a crucial volume in the history of World War II and of the Soviet Union and the most informed and compelling perspective on one of the greatest military confrontations of all time. In 1941, when Pearl Harbor shattered America's peacetime pretensions, the German blitzkrieg had already blasted the Red Army back to Moscow. Yet, less than four years later, the Soviet hammer-and-sickle flew above the ruins of Berlin, stark symbol of a miraculous comeback that destroyed the Germany Army and put an end to Hitler's imperial designs. In swift and stirring prose, When Titans Clash provides the clearest, most complete account of this epic struggle, especially from the Soviet perspective. Drawing on the massive and unprecedented release of Soviet archival documents in recent decades, David Glantz, one of the world's foremost authorities on the Soviet military, and noted military historian Jonathan House expand and elaborate our picture of the Soviet war effort—a picture sharply different from accounts that emphasize Hitler's failed leadership over Soviet strategy and might. Rafts of newly available official directives, orders, and reports reveal the true nature and extraordinary scale of Soviet military operations as they swept across the one thousand miles from Moscow to Berlin, featuring stubborn defenses and monumental offensives and counteroffensives and ultimately costing the two sides combined a staggering twenty million casualties. Placing the war within its wider context, the authors also make use of recent revelations to clarify further the political, economic, and social issues that influenced and reflected what happened on the battlefield. Their work gives us new insight into Stalin's political motivation and Adolf Hitlers role as warlord, as well as a better understanding of the human and economic costs of the war—for both the Soviet Union and Germany. While incorporating a wealth of new information, When Titans Clashed remains remarkably compact, a tribute to the authors' determination to make this critical chapter in world history as accessible as it is essential. 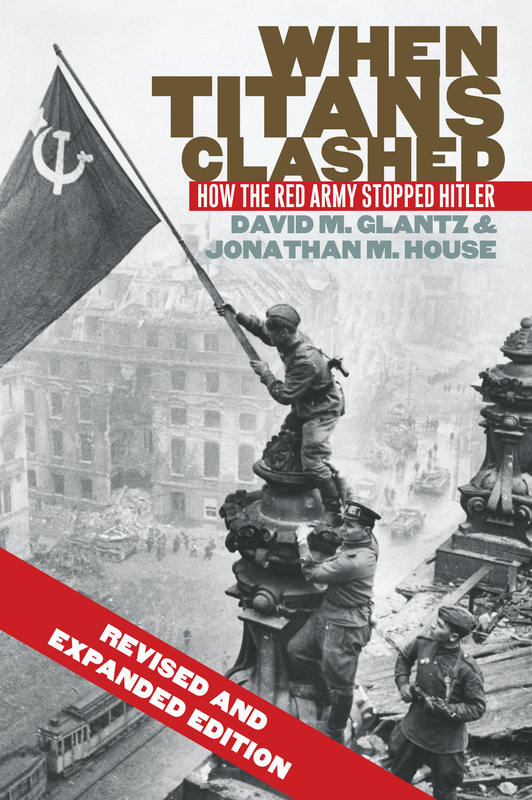 David M. Glantz and Jonathan M. House have collaborated on numerous volumes of military history, including The Stalingrad Trilogy and The Battle of Kursk.